Professor Mark Spearing is President and Vice-Chancellor (interim) of the University of Southampton. 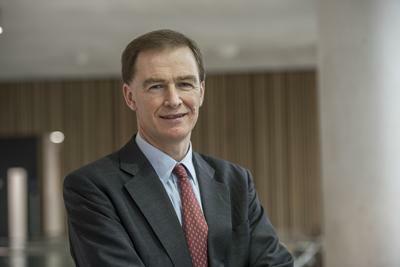 This interim appointment follows the retirement of Professor Sir Christopher Snowden on 08 March 2019 and will continue until a new substantive President and Vice-Chancellor is in post. Professor Spearing’s permanent position is Vice President, Research and Enterprise, at the University of Southampton. He is also a Professor of Engineering Materials in the Faculty of Engineering and Physical Sciences. Professor Spearing was previously Head of the School of Engineering Sciences at the University of Southampton. Professor Spearing received his Ph.D from Cambridge University Engineering Department in 1990, working on the fatigue damage mechanics of carbon fibre composites. He worked as a research engineer at UC Santa Barbara from 1990-92 where he developed models for the failure of high temperature ceramic materials. From 1992-94 he was an engineering specialist at BP Research and subsequently a research engineer for Carborundum Microelectronics, where he was a member of the electronic packaging technology development team. From 1994 to 2004 he was on the faculty of the Department of Aeronautics and Astronautics at the Massachusetts Institute of Technology, receiving tenure in 2001, and being appointed Full Professor in 2004. Professor Spearing's research focuses on developing mechanism-based models and design approaches for the failure of advanced engineered materials. His research activities involve advanced composites, layered materials and materials, structures and processes for microelectromechanical systems (MEMS) and other Microsystems. He has particularly worked on the development of wafer bonding processes for the creation of 3-D structures in MEMS and other Microsystems. This activity has involved developing an understanding of the interaction between surface chemistry, local and wafer level deformation mechanisms and tool and process parameters. He also works in the area of structural health monitoring of composite structures. His educational activities focus on integrating the teaching of materials and structures. In November 2004 Professor Spearing received a Royal Society Wolfson Research Merit Award. He is an Associate Fellow of the American Institute of Aeronautics and Astronautics and was chairman of that organization's Materials Technical Committee from 1997-1999. He is also a member of the Materials Research Society and the American Society of Mechanical Engineers. He is an editor of J. Microelectromechanical Systems, the European Editor of the Journal of Composite Materials and an editorial board member of Nanotechnology. He has published over 160 papers including over 100 in refereed journals. He is a co-inventor on 5 patents. He has organized Materials Research Society symposia on the Materials Science of MicroElectromechanical Systems in 2000, 2001, 2007 and 2008. Professor Spearing twice won the MIT Aero/Astro Department's award for outstanding teaching in 1995 and 1997, and its award for student advising in 1999 and 2000. Yunus, E. M., McBride, J. W., & Spearing, S. M. (2008). Low force electrical switching using gold coated vertically aligned multi-walled carbon nanotubes surfaces. IEICE Technical Report, 108(296), 61-64. Chen, K-S., Spearing, S. M., & Nemeth, N. N. (2001). Structural design of a silicon micro turbo generator. AIAA Journal, 39, 720-728. Spearing, S. M. (2000). Durability of fiber composites - the case for mechanism-based models. Journal of Composites Technology and Research, 22(4), 177-186. Spearing, S. M. (1997). Design diagrams for reliable layered materials. AIAA Journal, 35(10), 1638-1644. Spearing, S. M., & Zok, F. W. (1993). Stochastic aspects of matrix cracking in brittle matrix composites. Journal of Engineering Materials and Technology, 115, 314-318. Beaumont, P. W. R., Spearing, S. M., Kortschot, M. T., & Ashby, M. F. (1992). The physical modelling of damage in carbon fibre laminates. Advanced Composites Letters, 1, 19-22. Ayon, A. A., Buchheit, T. E., Kahn, H., & Spearing, S. M. (Eds.) (2002). Materials science of microelectromechanical systems (MEMS) devices IV. Materials Research Society. DeBoer, M., Judy, M., Kahn, H., & Spearing, S. M. (Eds.) (2001). Materials science of microelectromechanical systems (MEMS) devices III. Materials Research Society. Borstnar, G., Mavrogordato, M., Yang, Q., Sinclair, I., & Spearing, S. (2016). Modelling and quantifying Mode I interlaminar fracture in particle-toughened CFRPs. Paper presented at 17th European Conference on Composite Materials, Germany. Borstnar, G., Mavrogordato, M. N., Yang, Q. D., Sinclair, I., & Spearing, S. M. (2015). Interlaminar toughening mechanisms: in situ growth and modelling. Paper presented at 20th International Conference on Composite Materials, Denmark. Borstnar, G., Mavrogordato, M. N., Sinclair, I., & Spearing, S. M. (2014). Micro-mechanistic analysis of in situ crack growth in toughened carbon/epoxy laminates to develop micro-mechanical fracture models. Paper presented at 16th European Conference on Composite Materials (ECCM16), Spain. Bull, D. J., Spearing, S. M., & Sinclair, I. (2014). The role of particle-toughening in improving post-impact compressive strength. 16th European conference on composite materials, Spain. Borstnar, G., Bull, D. J., Mavrogordato, M. N., Sinclair, I., & Spearing, S. M. (2013). Micromechanistic analysis of toughened carbon fibre composite laminate failure by high resolution synchrotron computed tomography. Paper presented at 19th International Conference on Composite Materials, Montreal, Canada. Bull, D. J., Spearing, S. M., & Sinclair, I. (2013). Quasi-static indentation and compression after impact damage growth monitoring using microfocus X-ray computed tomography. ICCM 19: The 19th International Conference on Composite Materials, Canada. Bull, D. J., Helfen, L., Sinclair, I., & Spearing, S. M. (2012). Multi-scale 3D imaging of carbon fibre laminate impact and compression after impact damage using computed tomography and laminography. 15th European Conference on Composite Materials, Italy. Bull, D. J., Sinclair, I., Spearing, S. M., & Helfen, L. (2011). Composite laminate impact damage assessment by high resolution 3D X-ray tomography and laminography. ICCM 18: 18th International Conference on Composite Materials, Korea, Republic of. Scott, A. E., Hepples, W., Kalantzis, N., Wright, P., Mavrogordato, M. N., Sinclair, I., & Spearing, S. M. (2011). High resolution damage detection of loaded carbon/epoxy laminates using synchrotron radiation computed tomography. Paper presented at 18th International Conference on Composite Materials (ICCM-18), Korea, Republic of. Mavrogordato, M. N., Wright, P., Helfen, L., Sinclair, I., & Spearing, S. M. (2010). Assessment of laminate damage micromechanisms using high resolution synchrotron radiation computed tomography & laminography. Paper presented at ECCM-14 - 14th European Conference on Composite Materials, Hungary. Scott, A. E., Sinclair, I., Spearing, S. M., Mavrogordato, M. N., Bunsell, A. R., & Thionnet, A. (2010). Comparison of the accumulation of fibre breaks occurring in a unidirectional carbon/epoxy composite identified in a multi-scale micro-mechanical model with that of experimental observations using high resolution computed tomography. Paper presented at Materiaux 2010, France. Scott, A. E., Clinch, M., Hepples, W., Kalantzis, N., Sinclair, I., & Spearing, S. M. (2009). Advanced micromechanical analysis of highly loaded hybrid composite structures. Paper presented at ICCM17: 17th International Conference on Composite Materials, United Kingdom. McBride, J. W., Yunus, E. M., & Spearing, S. M. (2009). Gold coated carbon nanotube surfaces as low force electrical contacts for MEMS devices: part 1. 278-284. Paper presented at 55th IEEE Holm Conference on Electrical Contacts, . Yunus, E. M., McBride, J. W., & Spearing, S. M. (2008). Improving the contact resistance at low force using gold coated carbon nanotube surfaces. 507-513. Paper presented at Proceedings of the 24th International Conference on Electrical Contacts (ICEC 2008), . Luo, J. K., He, J. H., Flewitt, A. J., Spearing, S. M., Fleck, N. A., & Milne, W. I. (2004). Bimorph structure microgripper using diamond like carbon and metal. Paper presented at 5th international conference on Advanced Semiconductor Devices and Microsystems, . Shim, D-J., Sun, H-W., Vengallatore, S. T., & Spearing, S. M. (2004). Damage and failure mechanisms in high pressure silicon-glass-metal microfluidic connections. In D. A. LaVan, A. A. Ayon, M. J. Madou, M. E. McNie, & S. V. Prasad (Eds. ), Materials Research Society Symposium Proceedings: Micro- and Nanosystems (pp. 69-74). Materials Research Society. Turner, K. T., & Spearing, S. M. (2004). Measurement of work of adhesion on wafers for direct bonding. In D. A. LaVan, A. A. Ayon, M. J. Madou, M. E. McNie, & S. V. Prasad (Eds. ), Materials Research Society Symposium Proceedings: Micro- and Nanosystems (pp. 463-468). Materials Research Society. Turner, K. T., & Spearing, S. M. (2004). Mechanics of direct wafer bonding. 163-168. Paper presented at 2003 ASME International Mechanical Engineering Congress, . Luo, J. K., Flewitt, A. J., Spearing, S. M., Fleck, N. A., & Milne, W. I. (2004). Modelling and fabrication of microspring thermal actuator. In Nanotech 2004 Vol.1: Technical Proceedings of the 2004 NSTI Nanotechnology Conference and Trade Show (pp. 355-358). Danville, USA: Nano Science and Technology Institute. Turner, K. T., & Spearing, S. M. (2004). Role of wafer bow and etch patterns in direct wafer bonding. 166-174. Paper presented at The Seventh International Symposium on Semiconductor Wafer Bonding Science, Technology, and Applications, . Kessler, S. S., & Spearing, S. M. (2004). Selection of materials and sensors for health monitoring of composite structures. 365-375. Paper presented at Materials Research Society Fall Meeting, . McBride, J. W., Spearing, S. M., & Yunus, E. (2011). Carbon-nano tube surface for low current electrical contact applications. Tokyo, JP: Institute of Electronics, Information and communication Engineers.